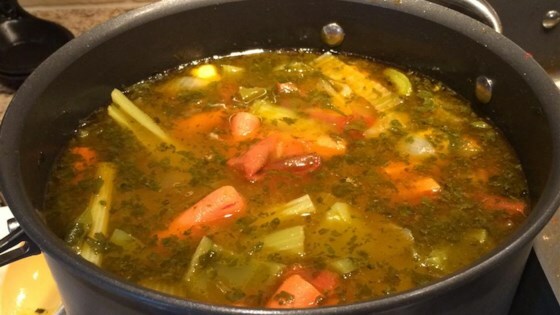 "This makes a broth that is slightly thick with a rich color and full flavor. The broth can be frozen in one or one and a half cup blocks for later use. This recipe also leaves you with a bowl full of delicious cooked vegetables, I love to snack on them cold." Pour the broth through a colander, catching the broth in a large bowl or pot. The liquid caught in the bowl or pot is your vegetable broth it can be used immediately or stored for later use. Although the vegetables are no longer necessary for your broth they are delicious to eat hot or cold, don't waste them! Loved this! I make lots of risotto, so this is a perfect recipe for me. Also, I purée the leftover vegetables and add them to a spaghetti sauce for later meals. This broth was okay. I think since I'm not a huge fan of cooked carrots and celery, that did it in for me. My boyfriend liked it a lot though. This is very good, I made it as it was written. Make sure and reduce it down or it will not have much flavor.